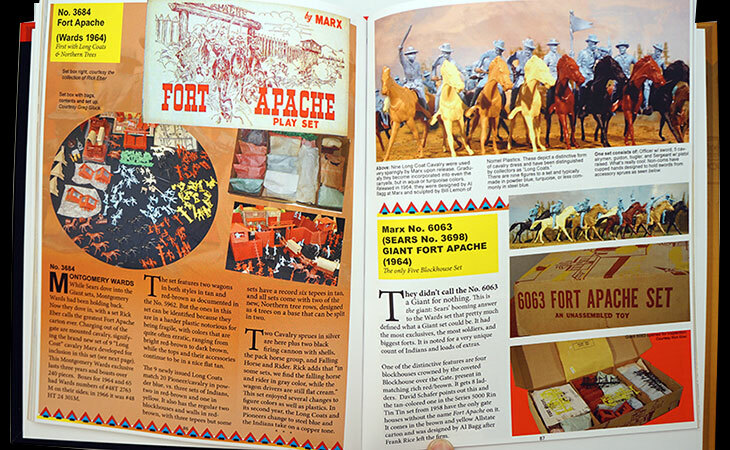 Fort Apache was deemed by its designer Frank Rice as “the King of Playsets,” and won the moniker during a poll open to all playset enthusiasts. It had a plastic stockade, steel headquarters, pioneers, U.S. Cavalry and Indians, tepees, cannon and horses in a finely made miniature scale that fit in one compact carton. But it came in so many versions and different cartons that they became the subject of a five part series in Playset Magazine covering many varieties available from 1951 through the end of the firm and beyond. It was an important resource, but the information was a bit spread out over numerous issues and "in-between" updates and a few corrections. And then we watched as the number of available back copies of Fort Apache set coverage dwindled -- and then sold out completely, to the point that soon, we figured there would be no resource for that set in total. A new book’s time had come. Information on undocumented Fort Apache Stockade and Fort Apache sets came in; and new photos; piling up in anticipation of “someday” doing a book on the subject. For instance a rare set sold at Western Auto stores, and color variations. And updates, published in subsequent issues, now knitted into the storyline. Everything has been revisited, freshly vetted by expert authorities, rewritten, added-to and done anew. Every Marx Fort Apache playset known to collectors is here, in color, some on two page spreads. There’s mint-in-box contents lists, factory documents, contents-by-set; contents by set number; figure groups, instruction sheets and vintage advertising, all in full Indian Wars color. This is the big Kahuna of Fort Apache with commentary throughout by the world’s greatest expert authorities and contributions by many collector specialists, from the very first set up through the Heritage sets released by the original Marx firm. (Order with Secure PayPal below), or CONTACT US.